2019. Interested and eligible candidates can apply through online official website of SSC is https://ssc.nic.in. The online application forms will start from 28-01-2019 onwards. The closing date to submit the filled online application form along with the necessary documentation is on or before 25-02-2019 to apply for the SSC JE Posts Recruitment 2019. The required qualification to apply for the SSC JE Posts Recruitment 2019 is candidates should have completed Diploma in Civil/Mechanical/Electrical Engineering. For more information about salary, age limit, and how to apply are given below for the SSC JE Govt Jobs Recruitment 2019. 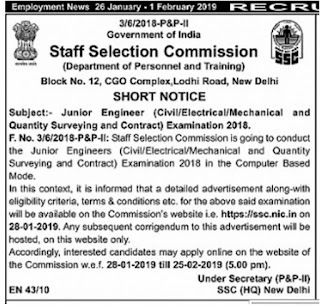 The age limit for the SSC Junior Engineer JE Recruitment 2019 is for the posts of JE (Civil and Quantity Surveying and Contract) jobs is 27years (upper age limit), for the JE (Central water commission /CPWD) jobs is 32 years and for JE (Date of Quality Assurance (Naval)/ Director General Border Roads Organization/ National Technical Research Organization MES/ Farrakka Barrage/ Central Water Power Research Station/) jobs is 30years. The required qualification to apply for the SSC JE Posts Recruitment 2019 is candidates should have completed 3years Diploma in Civil/Mechanical/Electrical Engineering. The application fee for the Gen/OBC candidates is Rs.100/- and for others, there is no application fee. Candidates will be recruited on the basis of computer-based test for the SSC JE Posts Recruitment 2019. The exam date will be on April (tentative). The admit card will be available from 10 days before the examination date. Interested and eligible candidates can apply through online official website of SSC is https://ssc.nic.in. The online application forms will start from 28-01-2019 onwards. 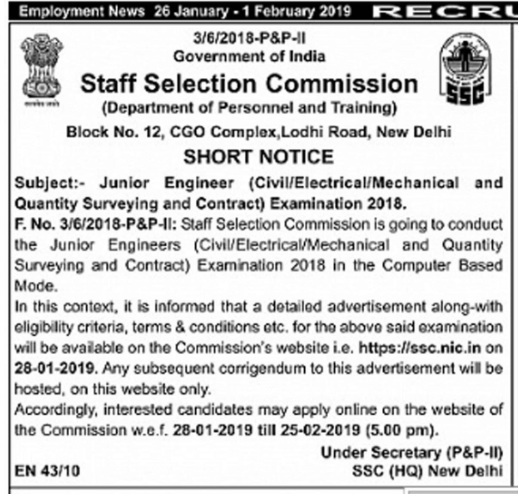 The closing date to submit the filled online application form along with the necessary documentation is on or before 25-02-2019 to apply for the SSC JE Posts Recruitment 2019.